Joseph-Siffred Duplessis (22 September 1725 – 1 April 1802) was a French painter, known for the clarity and immediacy of his portraits. He was born in Carpentras, near Avignon, into a family with an artistic bent and received his first training from his father, a surgeon and talented amateur. He subsequently studied with Joseph-Gabriel Imbert (1666–1749), who had been a pupil of Charles Le Brun. From 1744–47 or later he worked in Rome, in the atelier of Pierre Subleyras (1699–1749), who was also from the south of France. In Italy Duplessis became fast friends with Joseph Vernet, another Occitan. He returned to Carpentras, spent a brief time in Lyon then arrived about 1752 in Paris, where he was accepted into the Académie de Saint-Luc and exhibited some portraits, which were now his specialty, in 1764, but did not achieve much notice until his exhibition of ten paintings at the Paris salon of 1769, very well received and selected for special notice by Denis Diderot; the Académie de peinture et de sculpture accepted him in the category of portraitist, considered a lesser category at the time. He continued to exhibit at the Paris salons, both finished paintings and sketches, until 1791, and once more, in 1801. His portrait of the Dauphine in 1771 and his appointment as a peintre du Roi assured his success: most of his surviving portraits date from the 1770s and 1780s. He received privileged lodgings in the Galeries du Louvre. In the Revolution, he withdrew to safe obscurity at Carpentras during the Reign of Terror. 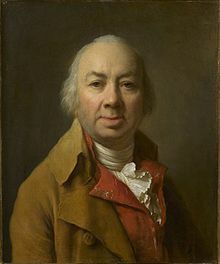 Afterwards, from 1796, he served as curator at the newly founded museum formed at Versailles, so recently emptied of its furnishings at the Revolutionary sales. His uncompromising self-portrait at this time of his life is at Versailles, where he died. He would adjust his style to the social condition of his sitter: his portrait of Charles-Claude, comte d'Angiviller, director of the Bâtiments du Roi, is as distant and conventional as his state portrait of Louis XVI in coronation robes (1776), while his realistic and intimate portrait of the opera composer Christoph Willibald Gluck (Kunsthistorisches Museum, Vienna) catches the composer at the keyboard in a moment of inspiration and his penetrating portrait of the sculptor Christophe Gabriel Allegrain (Louvre Museum, illustration) shows him having just laid down his chisel: this was the morceau de reception that gained him admittance to the Académie. His portrait of Benjamin Franklin (circa 1785), more than any other, has fixed the image of Franklin for posterity since it is reproduced on the U.S. hundred dollar bill. His portrait of the financier Jacques Necker hung at Voltaire's Coppet Castle. Several reduced versions were made, one of which is at the Louvre. Many of his portraits received a wider circulation as engravings. Wikimedia Commons has media related to Joseph Duplessis. ^ His middle name has also been given as Siffrède or Siffrein (Lester C. Olsen, Benjamin Franklin's Vision of American Community, 2004, p. xiii). ^ The original disappeared, but has been identified in the Musée Ingres, Montauban (ref Ministère ). ^ Duplessis received many commissions for duplicates: one is at the National Portrait Gallery, London; another at the North Carolina Museum of Art. Joseph-Siffred Duplessis The most comprehensive on-line sketch of his career. (Fine Art Museums of San Francisco) Portrait of a Gentleman (Jean-Baptiste-Francois Dupre? ), ca 1779 - 1782. Brief sketch of his career. (Louvre Museum) Joseph-Marie Vien, 1782. A repetition, in oil en grisaille on paper (mounted on canvas), is at the Museum of Fine Arts, Boston. (Metropolitan Museum) Benjamin Franklin, 1778. Shown at the Salon of 1779. This page was last edited on 21 September 2018, at 10:56 (UTC).